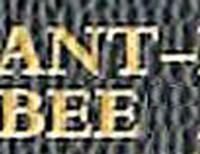 How did the name “Ant-Bee” originate? The name came about for a two main reasons: First, I am a huge fan of Captain Beefheart and his album Trout Mask Replica is a big influence on my music. One of the tracks on the album is called Ant-Man-Bee – so I shortened it and called my group ANT-BEE. Second, I grew up in the South East (USA) although my family is originally from the North East. In the city I grew up in, Charlotte, NC, at the time in the late '60s and early '70s, it was not too distant from Mayberry on the Andy Griffith show, which was based in a small town in North Carolina. So due to my southern roots I also credit the name to Aunt Bee – the matronly Auntie on the show. I have too many to name but some of them include Frank Zappa and The Mothers, The Beatles, Jon Anderson/Yes, Alice Cooper, Grand Funk Railroad, Captain Beefheart, Daevid Allen/Gong, T. Rex, Popol Vuh, Santana, Miles Davis, Bill Bruford, The Who, Pink Floyd, Bill Nelson, Mike Oldfield, Beach Boys, Flo&Eddie, Weather Report, John McLaughlin, Sun Ra, Focus, 10cc, Kevin Godley, Magma – on and on and on. I try to live in the here and now, so I don't think too far into the future because I have so much going on right now. First, my latest ANT-BEE CD Electronic Church Muzik was released last month on Barking Moondog Records (www.barkingmoondog.com) and I have been promoting it. The album features guest appearances by Michael Bruce, Daevid Allen, Peter Banks, Jan Akkerman, ex-Mothers of Invention members and many other notable music artists. I was also recently interviewed for two new UK documentaries on Frank Zappa. About two years ago I was filmed for the UK documentary Frank Zappa and the Mothers of Invention – In The 1960s – it is a NetFlix top pick, by the way. The first of the new documentaries, which focuses on Zappa's record labels in the late 1960s – Bizarre and Straight – and will be released in the summer. I am also completing a book on Badfinger with original member Joey Molland as well as trying to get the book I wrote with Michael Bruce on the original Alice Cooper group called 'No More Mr. Nice Guy' (a best seller) back into print. Lastly, I run a full-line music publicity company called Glass Onyon PR (www.ant-bee.com/glassonyonpr.htm). I am currently doing press for Jon Anderson, Neal Morse, Gregg Rolie, Steve Morse, Le Orme, Magma, Blackmore's Night and Wishbone Ash (amongst other music artists). You’ve got an amazing cast of characters on this disc. How did you hook up with them? In the case of the Mothers members, I first started recording with Bunk Gardner and Don Preston back in 1990. I've recorded with them, wrote a book and have done PR for them for the past 20 years. Michael Bruce from the Alice Cooper group I linked up with in 1995 when I was recording my 3rd ANT-BEE album Lunar Muzik. I was a big fan when I was 13 so it was very cool to hook up with my teenage idol. We wrote songs together, recorded and toured as the new Billion Dollar Babies in the late '90s. We also wrote a best selling book together about his days in the Alice Cooper group. Peter Banks and Jan Akkerman I have known since 1997 (again I was a big fan of both Focus and YES when I was a kid). Daevid Allen recorded a track on my third album and did the artwork to my 1997 Child of the Moon EP. Napoleon Murphy Brock was the lead singer for Zappa's band from 1973 to 1975 – a great vocalist! I have worked with him since 2000. I linked up with original Utopia keyboardist Moogy Klingman in 2000 when I was writing my first biography on Todd Rundgren. No problem as long as they are not selling them – it’s a way of preserving music history. One wouldn't have to trade tapes if all the concerts bands themselves have actually recorded through the years were made available. You can't tell me someone wasn't taping Jethro Tull's Passion Play concert through the soundboard or Pink Floyd's Animals shows – yet you can't find any legitimate releases, so one has to track down any recordings of these historic events they can find. I don't want to say as it's bad energy to do so – there are a ton of them. I've had several – one of the biggest was when I was touring with Michael Bruce, original songwriter, guitarist with the Alice Cooper group (he wrote most of the hits). We were playing on a small stage in the middle of nowhere and the stairs were a few feet from my drum kit. During the encore, which was “School’s Out,” in the spirit of the original Alice Cooper group I would come out from behind my drums and throw confetti at the audience while the smoke machine was puffing, the strobe light was strobing and the band was making noise. I misjudged the amount of footage I had to get to the front of the stage and fell down the staircase. No one in the band or roadies knew I had fallen and so I was lying there for at least a minute or so until I came to my senses and hobbled up the stairs just in time to get to my kit and end the song. The band and audience never knew! 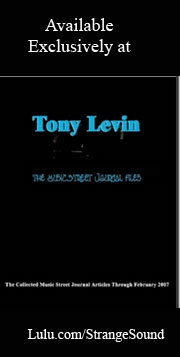 MSJ: This interview is available in book format (hardcover and paperback) in Music Street Journal: 2011 Volume 3 at lulu.com/strangesound.